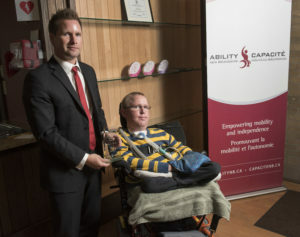 Left to right: Stephen Banks, Ability NB Treasurer, & John Wood. John Wood – A recipient of a 2014-2015 award is John Wood of Oromocto, NB. Anyone who knows John knows how much he cares about his family and his community. It was his passion that led him to build the John Wood Foundation. Founded in 2012, the John Wood Foundation Inc. focuses on raising money that is allocated to benefit those in need and enable people with significant disabilities to obtain the support they need to succeed in life. To date, John and his team have raised over $120,000 to support persons with a disability in New Brunswick. 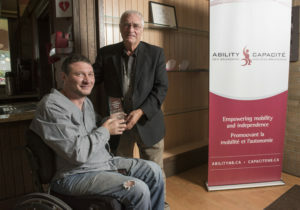 John’s efforts and his foundation have helped Ability NB service participants who rely on low incomes reach their goals for mobility and independence. Funding has helped purchase disability supports such as: a scooter, a trailer to transport a scooter, orthotics, a ramp, accessible vehicle modifications, and a back-up battery supply, in case of power outages, for a pressure relief mattress. John has helped individuals we work with achieve goals such as being able to visit family members, be more active in the community and transition out of the hospital to home. Ability NB is forever thankful that John’s passion and dedication to others with a disability is a gift that keeps on giving. Left to right: George Woodworth, Ability NB Board Secretary, & Robin Hanson. Robin Hanson – The recipient of a 2014-2015 award is Robin Hanson. When Robin first contacted Ability NB for advice on accessible design for areas in the Oromocto watershed, we knew right away that he would be a valuable member of our network of community partners. Robin and his team of volunteers set a mission to make changes to the White Rapids Adventure Trails and the Currie house so more members of the community and visitors could enjoy the area as much as they do. Robin and his team created accessible viewing areas near the rapids and have recycled old pavement to create great accessible trails! The result is a place so vibrant and serene that is a must to see and experience. You will walk or roll through one of New Brunswick’s greatest white pine forests and view many sculptures carved out of pine trees – much of Robin’s own artwork. A Civil Engineering technologist by profession and a self-taught artist, Robin was born in and lives in French Lake, NB with his wife Lynn. He is a father of four, has five grandchildren, loves nature and the outdoors and is an avid community supporter. Ability NB applauds Robin’s leadership and this work to create more accessible, inclusive communities – and recreation opportunities for all!